Spiritomb was my first go at the idea. Will replace others later, but I added in Spiritomb. 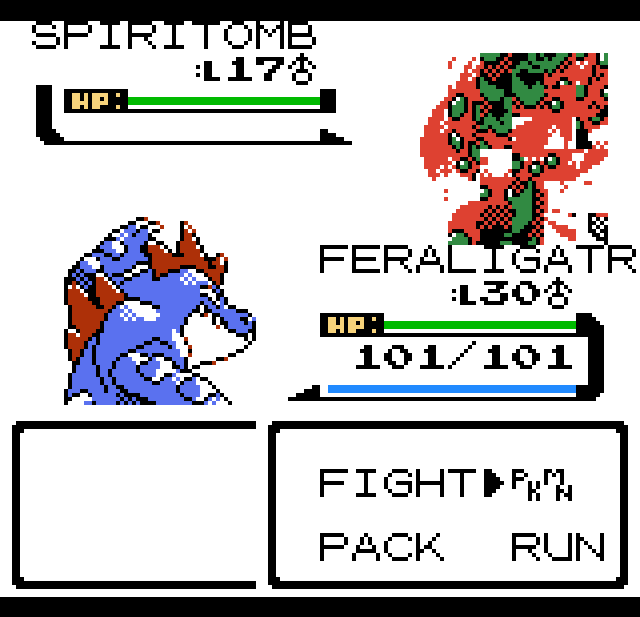 So far I have a proper dex entry and back sprite. However, the front sprite won't display correctly. 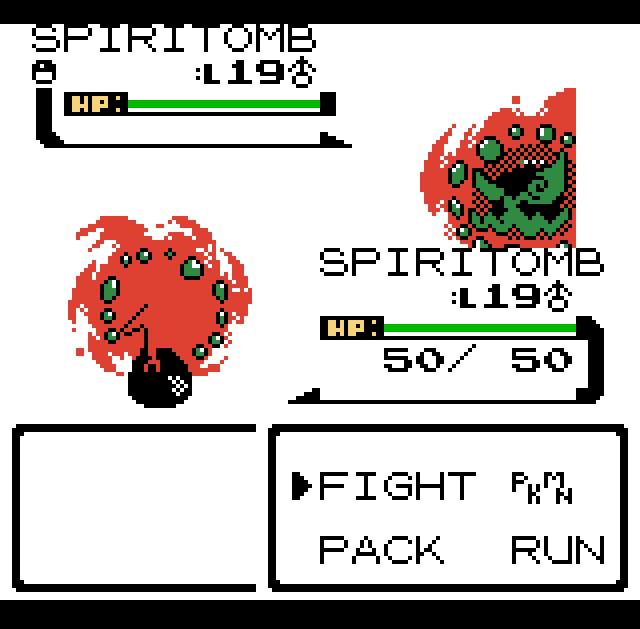 So I hadn't changed the dimensions in the data/base_stats/spiritomb.asm to 5x5 like they were supposed to be. 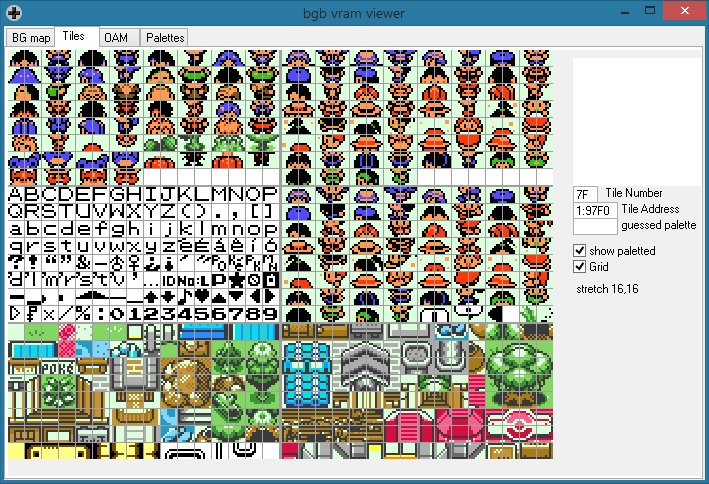 The backsprite is 6x6, frontsprite is 5x5. I got it to stop being all scrambled, but now it won't display correctly. Clearly a bit off center. Or can anyone tell me why this Strength Boulder is displaying as an off colored player sprite? In engine/overworld.asm, make sure that the outdoor sprite table for the group that map is in contains SPRITE_BOULDER. Thanks for the help, Rangi! I was able to change SPRITE_FRUIT_TREE to SPRITE_BOULDER in Group11Sprites (Route 34/Goldenrod) in engine/overworld.asm, but it won't take effect in game. It still just shows up as the brown player sprite. Thoughts? Edit: After further research, I can't actually find any files that make reference to "engine/overworld.asm"... so I think it's getting looked over in cygwin. But I'm not sure where to put the "INCLUDE engine/overworld.asm"
I tried putting it in main.asm and it returned with a bunch of errors. The above screenshot is using all the available VRAM. (I filled up the text graphic with more characters, and expanded the tilesets to use up the bottom-right sixth.) For some reason the outdoor sprite tables allow you to list more sprites than will actually fit. Edit: INCLUDE "engine/overworld.asm" is definitely in main.asm. If it weren't, your ROM wouldn't even compile. I knew you could only have a limited number of sprites within any map group. 9 walking, 11 maximum. 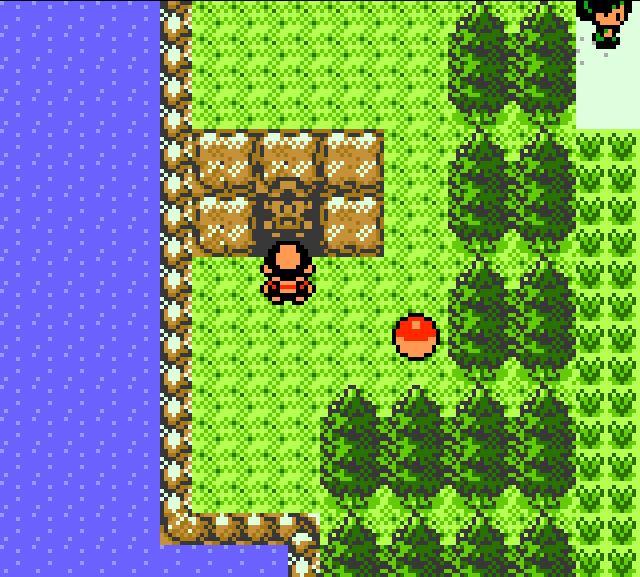 That's why I replaced the berry tree in Group11Sprites because the berry tree isn't used anywhere in Route 34 or Goldenrod. And I'm not crazy, I've searched for it all night haha. It's not at all referenced in the main.asm. At least not for me. I'm using tppcrystal251pub, so everything I do just seems to be slightly more difficult. Edit: Something must be going on, because I've searched the entire repository and can't find a single mention of INCLUDE "engine/overworld.asm"
Okay, so tppcrystal251pub has a different file structure than the latest pokecrystal. 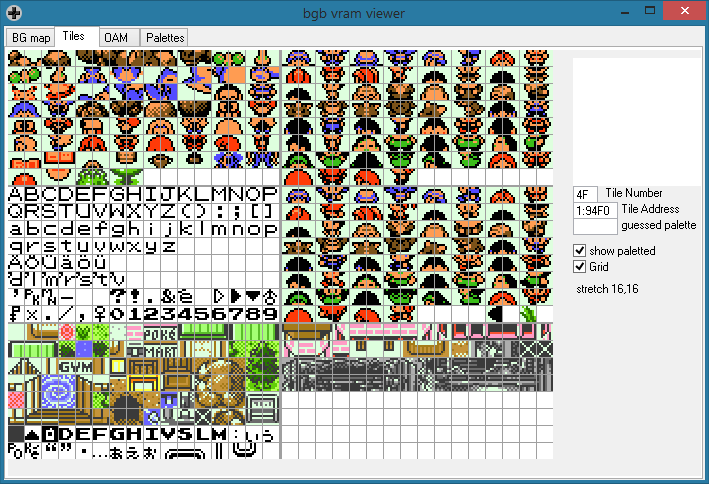 Then find its equivalent of engine/overworld.asm:Group11Sprites and update that. So engine/overworld.asm exists, implying it's used; but you can't find it (nor does it exist in the online Git repo), implying it's not used. This is a contradiction, therefore, one of your assumptions is wrong. My guess is that you created the file at some point, probably by copying it from pret's pokecrystal. 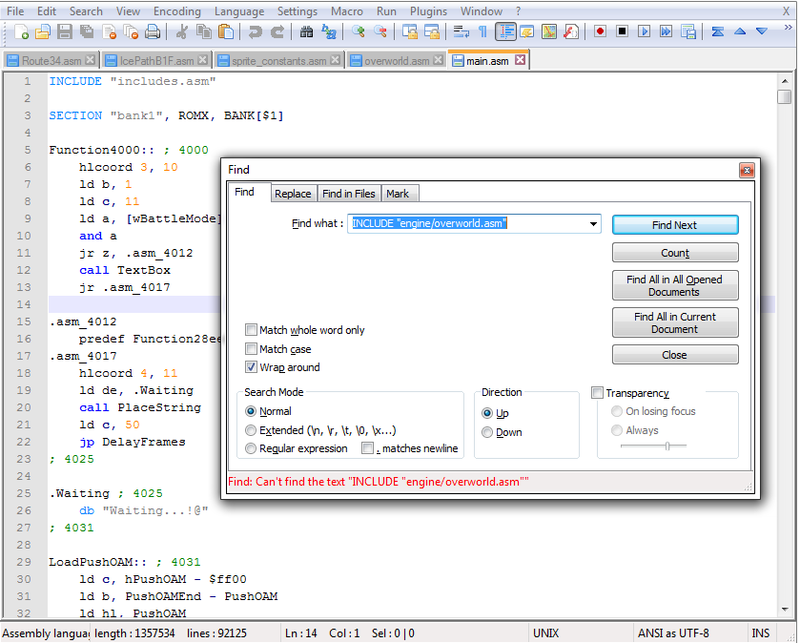 Somewhere in TPP's actual source code is what you want to edit. Try searching for content that you expect to be there, like "Group11Sprites" or "SPRITE_FRUIT_TREE". And delete the red-herring engine/overworld.asm already. Wow, when you're right, you're right. Although "engine/overworld.asm" did come with the tppcrystal251pub repository, all of it's contents were already placed within the main.asm. Kind of frustrating that there's loose files in there, but it should solve my problem! Wouldn't have thought of it without your help, so thank you! It initiates a pokemon battle which I got to work, but I'd like to make the rock disappear after the battle ends. I've got it to play the strength sound effect, and the battle won't start again after finishing, But I don't know how to make the rock disappear.